Originally published in 1948, Think Your Way to Wealth has been out of print and unavailable for many years. This new Tarcher Success Classics edition reproduces the complete, original text just as Hill first presented it. The dialogue between Hill and Carnegie represents an invaluable, irreplaceable playbook of success strategies that can change the life of any reader, just as they changed Hill’s life that day. Finally back in print, this true lost classic records Napoleon Hill’s first, fateful encounter with industrialist Andrew Carnegie, where the young Hill learned the secrets to winning at life. Returned to print after many years of unavailability, here is the one-and-only trade edition of a treasury of wisdom. 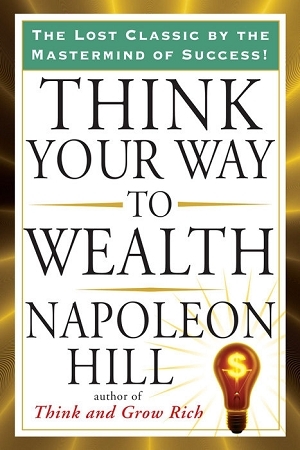 Think Your Way to Wealth captures Napoleon Hill’s initial encounter with Andrew Carnegie, who revealed the money-attracting strategy that Hill later popularized in classic books like Think and Grow Rich and The Law of Success. While working as a reporter for an inspirational magazine in 1908, Napoleon Hill chanced upon an opportunity that gave direction to his life. The young writer landed an interview with industrial giant Carnegie. Hill had just one key question for the magnate: What is the secret to your success? Carnegie’s response electrified Hill and launched him on a lifelong mission to distill the steps to success into a clear, definite protocol that could be used by any motivated man or woman. Think Your Way to Wealth is Hill’s vivid account of that seminal meeting. It captures Carnegie’s initial advice, how-to’s, practical steps, and concrete directions-all of which formed the basis for Hill’s groundbreaking books, and jump-started the field of business motivation.